Courtship is a grandiose term for what is actually a rather ill-tempered and seemingly tedious affair. Hedgehogs reach sexual maturity in their second year of life, and after this can breed every year until death. They reproduce between April and September, but the period of greatest activity, ‘the rut’, occurs in May and June in Britain. Males attempt to woo females in lengthy encounters that involve much circling and rhythmic snorting and puffing. The commotion attracts rival males to the scene and courtship can thus be interrupted as interlopers are confronted and rival males square up to one another; head-butting and chases are not uncommon. 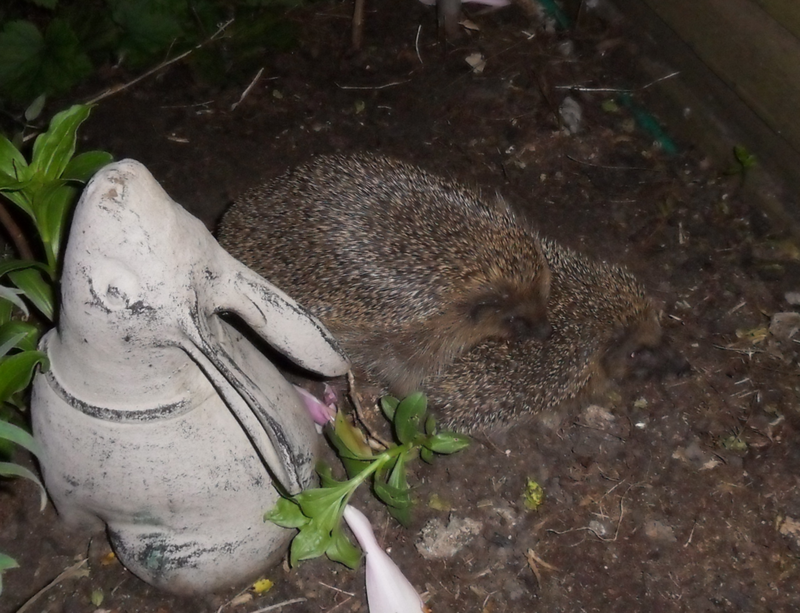 So don’t worry if you hear quite the racket coming from the garden, it could be hedgehogs! The actual process of mating is a delicate operation. The female adopts a special body position with her spines flattened as the male mounts from behind. Radio-tracking studies have shown hedgehogs are promiscuous. Both males and females often have several different mates in a single season. Hedgehogs give birth in June and July, and they have an average litter size of four or five young. However, they usually only wean two or three successfully. The mother is liable to desert or even eat hoglets if she is disturbed. Sometimes she will carry them in her mouth to a new location – a behaviour that can be seen in the video below. Young hedgehogs will leave the nest when they are around three to four weeks old to go on foraging trips with their mother. After around ten days of foraging with their mother the young will wander off on their own. Females are capable of having a second litter in late September or October, but these young are less likely to survive the winter. Experts think it is unlikely that female hedgehogs in Britain can successfully rear two litters in a season. Hoglets from the second litter need to put on weight very quickly to prepare for hibernation, and are often unable to put on enough weight to survive the period. These late litters can lead to ‘autumn orphans’ still foraging around well into winter sometimes in the day time and often looking underweight. Find out what to do if you see a hedgehog that looks ill or underweight.